Brands are not only big on Facebook or Twitter, some are also building a very strong presence on their Youtube Channels. 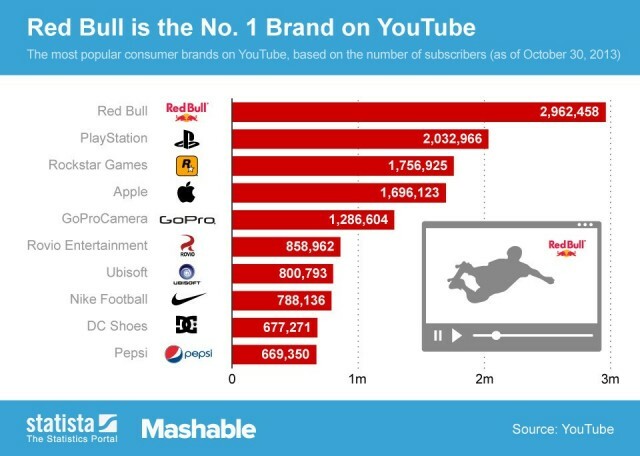 Mashable presents the 10 Biggest Brands on Youtube based on the number of their current Subscribers, thanks to data collected by Statista. So, what marketers should take from this? 1. Youtube can be a very important platform to explore further, especially if your brand’s activities are related to extreme sports, action, or gaming. 2. Youtube is one of the most visited places on the internet on a daily basis. It is actually the #2 biggest search engine on the web. Brand channels are visited by loyal Subscribers who seek your brand. 3. Youtube can replace presence on television, especially when your budget is small.